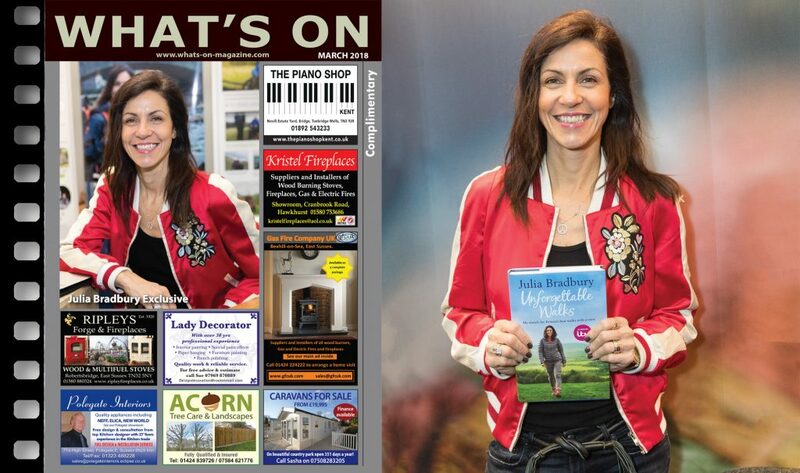 On Magazine March 2018 is out now with an exclusive of Julia Bradbury. You will also find a comprehensive list of forthcoming events for March in your area as well as many London exhibitions. What’s On Magazine met up with Julia at Destinations: The Holiday and Travel Show – The Essential Event For Travel Inspiration held recently at London’s Olympia. Packed with hundreds of leading and independent tour operators, over 75 tourist boards from across the globe, cultural entertainment, world flavours, travel celebrities and more, Destinations: The Holiday & Travel Show is the UK’s largest and longest-running travel event. With the largest choice of exhibitors anywhere in the UK and a huge variety of holiday and travel options on offer, the Destinations Show inspires you to discover new destinations and adventures from their expert exhibitors. There was an unbelievable line up of exciting talks, presentations, performances and flavours to enjoy over the three days at Olympia and we can’t wait for next years event. The Outdoor Guide (TOG) is an online resource set up by Julia Bradbury and sister Gina that aims to bring together information for walks all around the UK. Julia is also proud to be the first female President of The Camping and Caravanning Club. On TOG (The Outdoor Guide) you will find fab walks including those from Julia Bradbury’s most recent programme ‘Britain’s Favourite Walks: Top 100’. It aims to put companies with the same ethos together under one roof to inspire families to get out and explore this wonderful country. This is a place for people who love the outdoors. You don’t have to be an enthusiast. Maybe you’re just someone who enjoys hiking, or taking the family camping for the odd weekend. Or perhaps you like ambling around quaint villages, enjoy good country pubs or cycling through picturesque scenery. TOG is not in competition with anyone or trying to sell you stuff, but it’s about sharing stories, outdoor intelligence and knowledge. TOG wants the community to grow and to start sharing stories to inspire more outdoor adventures! AccessTOG is the mobility ‘arm’ of The Outdoor Guide run by disabled Ambassador Debbie North. TOG is committed to creating a countryside for all through the development of wheel-friendly walks for people with poor or no mobility. AccessTOG is putting together complete wheelchair-friendly packages for wonderful days out in the hills, towns and canals including the perfect pitstops, the perfect accommodation and the perfect cuppa. In Debbie’s previous ‘life’, before she became a wheelchair user, she was a keen hill walker and spent much of her time in the Yorkshire Dales, the Lake District and completing long distance walks like the Coast to Coast, The Dales Way and Cumbria Way. From a hospital bed she began researching all-terrain wheelchairs (ATW) as she was keen to get back out into the hills, despite having to now use wheels. Since then, as a result of major spinal surgery, she has got stronger and is now fulfilling her passion of hill walking using an ATW. She is also a bit of a dare devil seeking routes that are longer, higher and more challenging. A real up close and personal experience, if you like, with hills, mountains and weather.